2 Westbourne House is a very unique and sympathetically renovated period house, rich in history, dating back to the early 1800s. The dual aspect accommodation is laid out over three levels and comprises a floor area of 1,200 sq.ft. There are steps leading up to a beautiful period door over which there is a most attractive period fan light. The entrance level comprises a graceful hallway, living room, kitchen and guest wc. The living room is the showpiece of the house, due to its wonderful proportions, 25ft x 14ft, 12 ft high ceilings and many beautiful period features including marble fireplace, cornicing, sash windows at either end and polished wide plank timber flooring. The kitchen is of very generous proportions and leads to a basement which is currently being used as a utility room. Upstairs, there are two large light filled bedrooms, both of which have beautiful sash Windows with shutters. The rear bedroom benefits from an ensuite bathroom. The main bathroom is of most generous proportions and comprises both bath and shower. The property has been renovated recently. 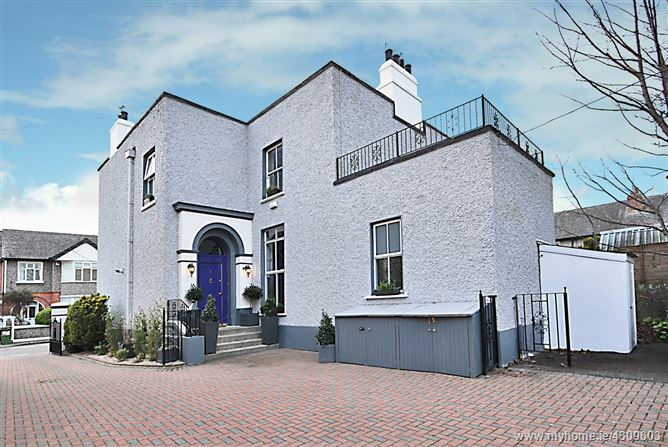 The house is located in an established and tranquil setting, just minutes from Terenure Village. A graceful hallway with a polished timber floor. A magnificent light filled room with 12ft high ceilings and many beautiful period features including marble fireplace, cornicing, sash windows at either end and wide plank polished timber flooring. Dual aspect and with an excellent array of wall/floor units, very generous proportions and leads to the lower ground floor office/study. Guest W.C:	2.30m x 1.72m With a storage area, w.c. and w.h.b.